There is something special about viewing an artist’s work in-progress. The raw, intimate glimpse of a temporary existence, an image in flux of both content and time. For Sharon Wegner-Larsen, this type of documentation is simply a part of her creative process; each piece seems to be painstakingly documented, and generously offered to the public in an engaging way. Talking to Sharon, you can tell she is a natural born teacher, someone who values the dedication and discipline attached to strengthening a craft. One of the qualities that I treasure most about my hometown is the tight-knit, supportive community that is downtown Sioux Falls. It seems that when any one of us is in a pickle, another soul is there, without hesitation, to have our backs. This week, my stand-out someone was fellow JAM blogger Kaitlynn Wornson. Kaitlynn stepped in for a couple of hours on First Friday and allowed me to dash off and sell some of my own artwork. So, with much gratitude and no further adieu, I give you a collaborative December First Friday review by Kaitlynn and yours truly. When attending an art show, there’s a slight chance that you’ll walk through the door and be a little lost. There’s a lot of excitement, conversation, and usually loads of free beer. Mix that all together and it can get rather confusing. Do I try to compliment the artist and their work? Do I fix my gaze on the art and block out the rest? It’s always hard to decide where to start with First Friday events and sometimes it can seem overwhelming. But, the Mad Hatter said that you should start at the beginning so I’m going to tell you how I wandered around on October’s First Friday (which was also the Art and Wine Walk). I’ve always envied quiet people. The type of people that absorb rather than spew, the seemingly solemn ingestion of everything around them. There is a thoughtfulness that surrounds the eyes, a focused energy that scoops in every detail provided. Don’t get me wrong, quiet people are not emotionless zombies–quite the contrary. They display a marriage of curiosity and wisdom, the silence attached to thought. I started my evening at the Sioux Falls Design Center for their PetchaKutcha Night. With an overflowing crowd settling in at 7PM for the speeches to begin, we were asked for four volunteers from the audience. These brave souls went on to narrate slides that popped up on the screen, each one unknown to the volunteer, and lasting 20 seconds long (coincidently the same amount of time per slide for the awaiting presenters). This activity serves as a warm-up for the room, and also gives the presenters that last boost of confidence; anyone can talk about something for 20 seconds. We can look at this activity in a broader sense, and take this as a lesson in interaction, and a nudge towards the need for open-mindedness. It’s important to keep an inquisitive attitude and a light-hearted approach when participating in community events such as this. Take an interest! Share your voice! “Meet. Create. Repeat.” This is the motto for the Sioux Falls Sketch Squad founded by Solomon Carlson. Yes, it’s happening again. The Art Collective 8 is near. If you have nothing to do Monday evening or even if you do, drop all and come down to Lucky’s on December 1. This is such a great way to get to know established and emerging local artists! Plus, I hold this event dear to me because the second time I went, I blogged about it in my very first JAM article! Ever since I went to the May Wine Walk this past spring, I’ve been itching to go again. 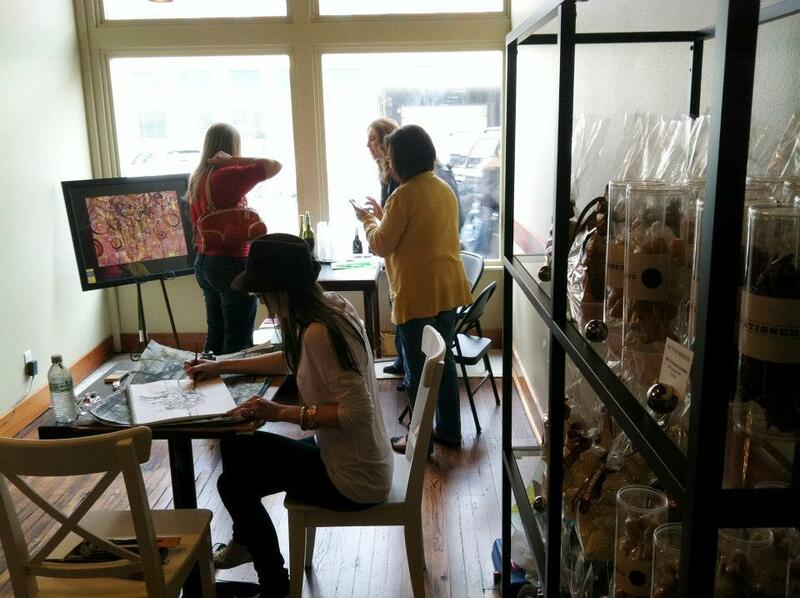 It was so much fun to see the local artists creating live work and to sample new wines. If you haven’t been downtown in a while or haven’t been before, I strongly suggest this event as a perfect opportunity to find out about both local businesses and budding local artists.